Visual-spatial ability is the ability to tell where objects are in space. It's the ability that lets you do things like navigating your way around the room, reading maps and charts, or merging into traffic. It's also used in many fields of study, including math, reading, geography, sports, and more. How so? Well, consider that reading requires you to know the arrangement of letters to form a word, or understand that certain shapes (such as "6" and "9") can have different meanings when they are rotated. Because visual-spatial ability is so important, kids should start developing it from an early age. There are many ways to help them, for example, with an app like RelationShapes. It's designed to develop visual-spatial reasoning and creative problem-solving skills through open ended play. In ReationShapes, kids explore over 60 puzzles across eight levels of increasing difficulty. As they play, they explore and discover how objects relate to one another, and learn how to solve problem in various, creative ways. The game is divided into two phases: Match It and Picture It. In Match It, kids are presented with two side-by-side pictures that contain the same number of shapes. Their task is to manipulate the shapes in either side, so that the two pictures match exactly. This may involve moving, resizing, or rotating the shapes on screen. Once kids have successfully matched both pictures, the next step is to personalize the picture using their creativity and imagination. They can rearrange or resize the shapes, and also add various stickers and backgrounds to create their own artwork. When they are happy with their creation, they can tap the camera icon to take a snapshot before moving on to the next puzzle. As I've mentioned, the game gets more challenging as it goes on. Each level not only introduces a new shape, but also challenges kids to explore unique spatial relationships. For example, shapes may be nested inside each other or combined to construct new, more complex shapes. 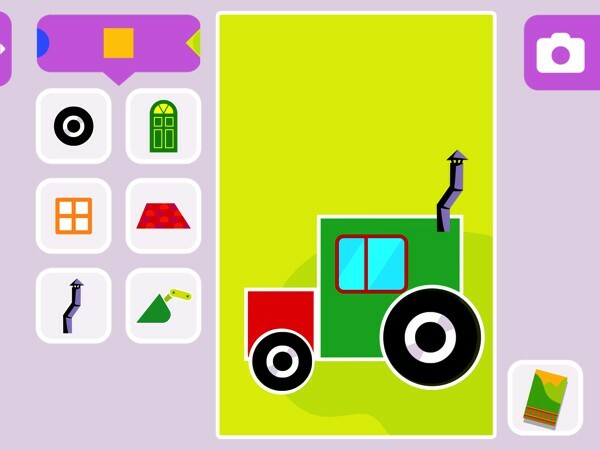 Each level also has a challenge where kids are asked to rearrange the shapes from memory. For the grown-ups, there exists a secured section where you can learn more about what each level offers along with your child's completed pictures. The section also includes six printable Extended Learning resources to help you continue the learning process beyond the screen. Parents need to know that RelationShapes is based on UNESCO award-winning visual education method created by sculptor and experimental artist Yaacov Agam. The method aims to teach visual literacy to preschoolers, and has been proven to be effective in helping kids develop fine motor skills and mathematic readiness. A highly collaborative app, RelationShapes sports a split screen design and multi-touch interface. This means that family and friends can play together on the same device. The app also allows you to create up to four user profiles and monitor their individual progress. The app is currently free to download, and has neither third-party adverts nor in-app purchases. it's available for iPhone and iPad, but keep in mind that devices with larger screens offer better user experience. RelationShapes is an excellent app. The gameplay is flexible and forgiving, so even the youngest kids will be able to play along. There are also plenty of thoughtful features that enhance the gaming experience, for example, hints will appear after kids have been idle for some time. And the pieces always snap in place when they are at the correct spots. In addition to helping kids develop crucial skills for more advanced learning later on, the app is also great for promoting creativity. With various stickers and backgrounds to choose from, kids can create all kinds of objects and creatures. What's more, they can collaborate with their friends and family for an added layer of fun. I highly recommend RelationShapes if you are looking to help kids develop visual-spatial ability and problem solving skills. The app is engaging and easy to use, and it allows kids to collaborate with their family and friends. Suitable for ages 3-6.